By now, even reliable comfort foods can lose their warming charm. Risotto, Jacket Potatoes, Dhal… all the old favourites which seemed so exciting in the late Autumn now seem to stretch in an unending starchy line to Summer. And while it’s not quite time to retire the masher for the season, a dose of fresh and “zingy” flavour in the form of a clean & aromatic soup is just the thing to shake up a hibernating palate. At Hart & Soul, we believe that Thai food is a fantastic cuisine. It’s so far removed from the flavours that our Western palates are used to. Tom Yum is the essence of Thai flavours: fresh, hot, sour, sweet and spicy. Set in a phenomenal translucent broth that comforts the soul. The soup is aromatic enough to cut through even the stuffiest of winter colds. Did you know that the name Tom Yum simply means hot and sour soup? What’s also great about this soup is that it can contain anything; beef, chicken, crab, prawns, vegetables or tofu. It’s a very adaptable recipe which also has the added benefit of being ridiculously quick to make once you’ve amassed the ingredients – just what you need after a busy day! 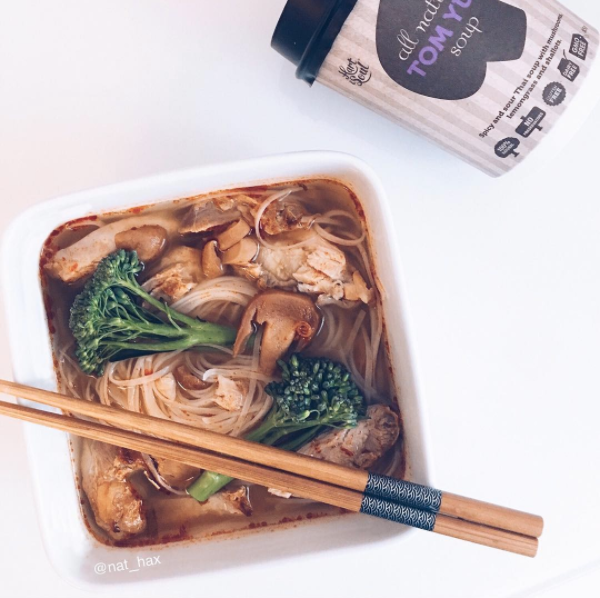 The lovely Natalie (nat_hax) threw this healthy, hearty, chicken and vermicelli tom yum soup together using our Hart & Soul Tom Yum Cup for a quick, easy, warm & comforty goodness soup. Damn girl! Place the chicken in a saucepan over high heat. Pour boiling water over the chicken until just covered. Bring to the boil. Reduce heat to low and gently simmer for 10 minutes. Add broccolini and noodles to the saucepan and cook for a further 2-3 minutes or until chicken is cooked through and noodles are tender. Carefully drain the water from the saucepan. Slice chicken. Add chicken, broccolini and noodles to a bowl. Warm up Hart and Soul Tom Yum Soup as per cup instructions. Pour soup over chicken, broccolini and noodles, and serve immediately.